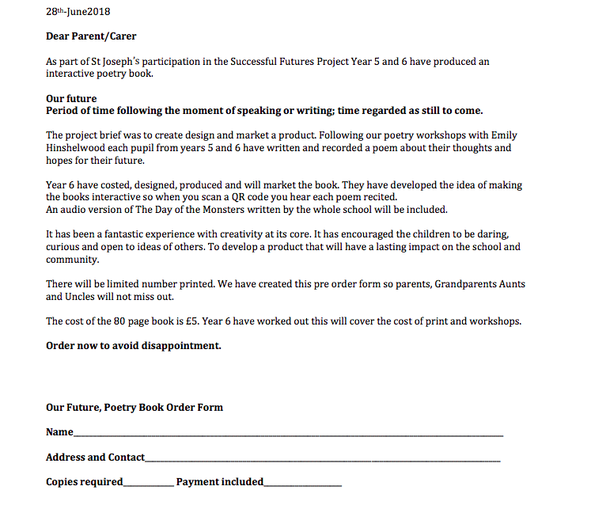 Dear Parent/Carer As part of St Joseph’s participation in the Successful Futures Project Year 5 and 6 have produced an interactive poetry book. Our future Period of time following the moment of speaking or writing; time regarded as still to come. The project brief was to create design and market a product. Following our poetry workshops with Emily Hinshelwood each pupil from years 5 and 6 have written and recorded a poem about their thoughts and hopes for their future. Year 6 have costed, designed, produced and will market the book. They have developed the idea of making the books interactive so when you scan a QR code you hear each poem recited. An audio version of The Day of the Monsters written by the whole school will be included. It has been a fantastic experience with creativity at its core. It has encouraged the children to be daring, curious and open to ideas of others. To develop a product that will have a lasting impact on the school and community. There will be limited number printed. We have created this pre order form so parents, Grandparents Aunts and Uncles will not miss out. The cost of the 80 page book is £5. Year 6 have worked out this will cover the cost of print and workshops. Order now to avoid disappointment.